Greek street food has recently become a game changer in Sydney eateries. No longer is a ‘”gyro”, often referred to as a souvlaki, a quick, cheap, greasy eat on the run. The gyro has been has gone back to its roots, all the way from Athens to here in Sydney, with many Greek street food eateries recreating their homeland traditional food, with a westernized touch. The gyro is traditionally slow roasted meat, served on pita bread with tomato, onion and tzatizki; however, all over Sydney you will find all kinds of exciting variations, each with different a different flare to entice us Greek-loving-addicts. Greek food is definitely no longer just about feta cheese and olives: it is now slowly becoming a food culture, complete with a cult following. 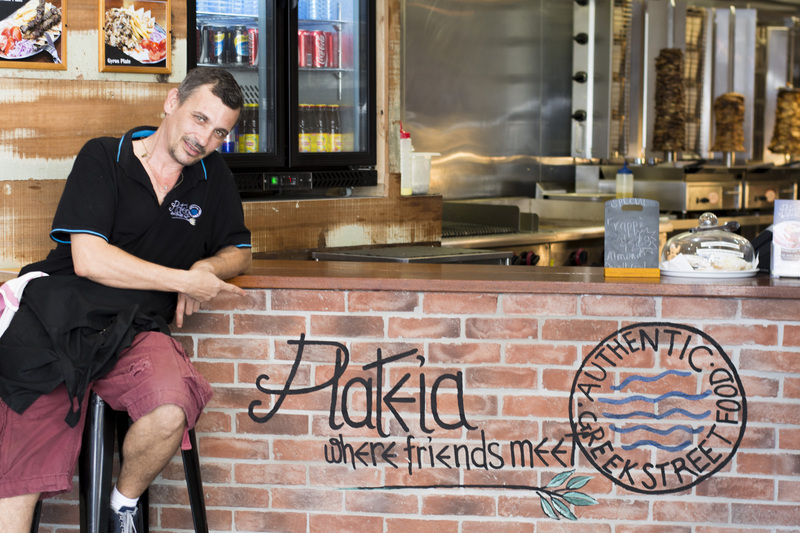 Here at You Chews we have sourced the best Greek street food we could find in Sydney: Plateia. ‘Plateia’ is the Greek word for ‘town square’, a place where masses of people gather to celebrate and socialise. The Greek casual eatery, which is aptly named Plateia – Where Friends Meet, in Potts Point adopted this concept to provide a casual and comfortable place where friends and family meet, socialise and celebrate. When I first visited Plateia, I instantly understood the meaning behind the name: delicious food made from the freshest herbs that had me licking my fingers, really does bring people together. Not to mention, the comfortable and inviting atmosphere created by the chef and staff made it a place I long to revisit with my friends for casual meetings. I had the pleasure of talking to Pamela, the owner of Plateia to share she and her husband’s story. As you know, I’m Pamela Rogaris and am married to Chris and have 2 gorgeous children. My parents and in-laws were all born in Greece and migrated to Australia many years ago. My family and I travel to Greece often for holidays (typically every two years). My family is from the island of Lesvos and my husband’s family is from Tripoli (in the Peloponnese) We love the food there and the relaxing atmosphere (which I suppose is normal when you are not working 😉 ). Were you always a chef? If not, what made you decide to change careers? My entire working career has been in an office behind a desk and to be perfectly honest not something I have really ever enjoyed. I suppose it has always been a case of, ‘well it’s a job and it pays the bills’. But at the same time I have always known that my personality is better suited to a more customer focused industry where I can meet and talk with people. My husband has been telling me this for years as well. I was at that stage in my career where I desperately wanted to make a change so I could actually enjoy my job when I got up to go to work. I always talked about having a cafe or restaurant because I thought that would just suit my personality but never had the experience or was always too afraid to try. When we travel to Greece on our holidays we are always visiting the various Souvlaki / Gyros restaurants in the areas. In almost every village, you will find one; they are normally referred to as “souvladsithika“. There are so many over there and my family, and I have always loved the experience. The name Plateia is a reference to a central place in a village or society where people meet to eat, celebrate and enjoy their time together. There are normally many restaurants and bars for people to choose from. Essentially, we want our place to be a place for our local community to come, meet with their friends and enjoy our food. What makes our business unique is simple, really: that is, there is nothing else like it in the immediate area. Our meat is of great quality, we use the finest herbs and spices when marinating our meat and most importantly everything is fresh. We never compromise our quality even if that means there has to be a delay in serving time. What’s your signature catering dish? 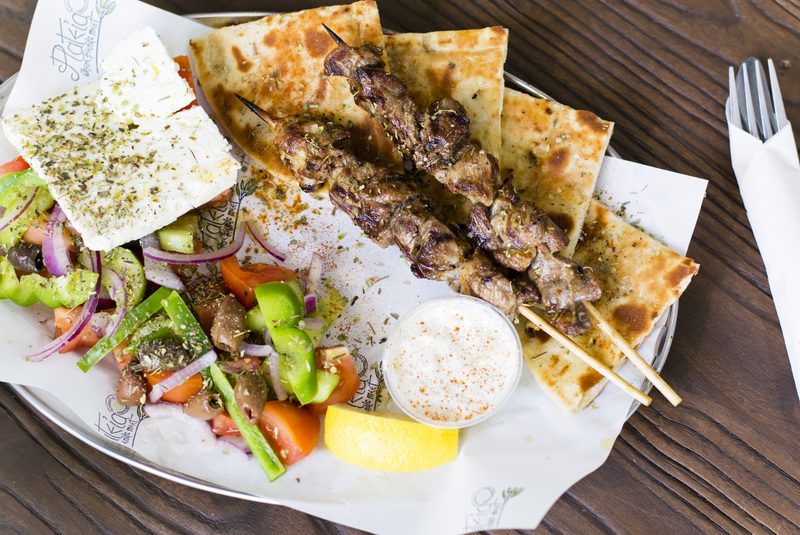 Whilst our pita gyro (i.e., our gyro meat, with salad, tzaziki, etc all wrapped up in a greek pita bread) is our signature dish, our open plates and souvlaki skewers (grilled marinated pork, chicken or lamb on a skewer) are fast catching up in popularity as well. As this stage, we are continuing to focus on spreading the word through social media, great service and experience. We have always believed in that old saying, “build it, and they will come”. The feedback has been tremendous. It’s an awesome feeling to hear people come in and say that “we have been hearing about how good this place is so had to come and try” and for them to then say after the meal, “now I know what all the fuss is about”. On one day, we had one person come in 3 times. We have so many regulars now which must mean that we are doing something right. Another key message that we keep hearing from our customers is that we are providing many of the locals with something completely different when compared to what they have had to deal with in the past. Here at You Chews we love hearing inspirational stories about food, just as much as we love to eat it. Take part in Plateia’s food journey and spread the authentic Greek food love to your office – opa!